The Boris Karloff version of Count Dracula will always be the ‘definitive’ vampire in our minds here at Madtini Labs (although Gary Oldman did an awesome job too). Our interns may go on dreamily about spending eternal life with Twilight’s Edward, Bill or Eric of True Blood – we know that the Count could have kicked their brooding, sparkling butts around Transylvania any day of the week. Once we read the name of this drink on the Intoxicologist’s blog we knew we had to include it in our 2010 collection of Halloween drinks. 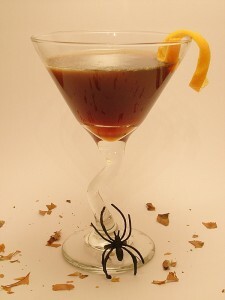 The drink is a classy blend of coffee liqueur and citrus flavours – but be careful we haven’t tested this one is daylight yet. Combine the ingredients in a cocktail shaker half-filled with ice. Shake, then strain into your chilled martini glass. Add a blood-orange wedge s garnish.